Fixed the shirt - the halftones on his shirt might display a little weird on screen but will look great printed! 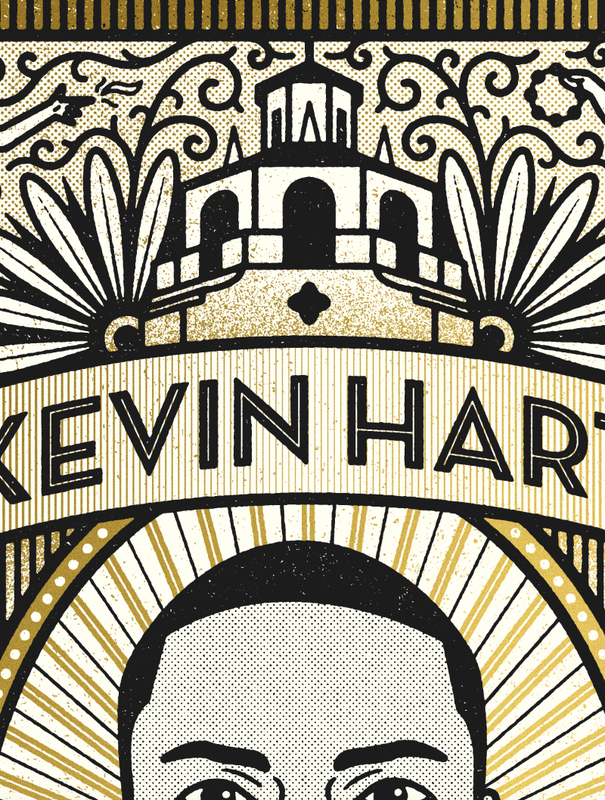 Here is the final art for the Kevin Hart poster - its set up to be a 2 color screenprint with metallic gold ink, should look really awesome printed! After reading what you wrote about him being an avid poker player I thought it could be cool to do something inspired by the back design of playing cards. Kevin would be featured in the center surrounded by an intricate design featuring card suits, the architecture of the theater, and an angel and devil on either side. The angel and devil were inspired by the promo video for his tour where he is sitting in his bus and arguing with multiple versions of himself - it reminded me of the classic trope of an angel on one shoulder and a devil on the other. I think it could be really cool to print these with just one color (red or blue like the classic card deck) and maybe a hit of metallic ink to give it some flare!